Skoda's latest offering will compete with the likes of Toyota Fortuner, Ford Endeavour and Isuzu MU-X as well as Volkswagen Tigua. 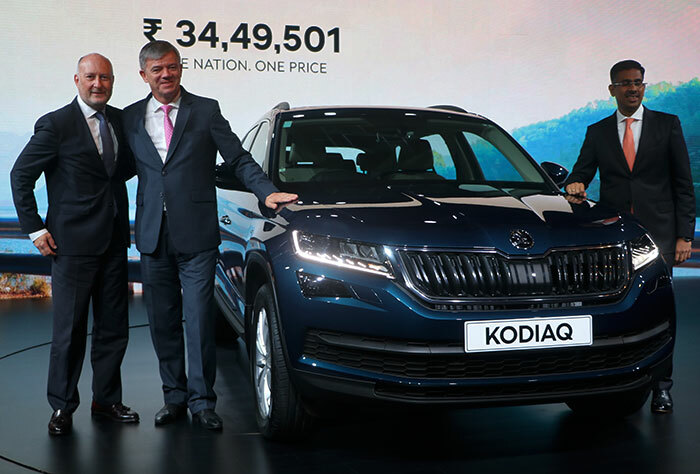 The Kodiaq is finally here, and it marks Škoda's entry into the 7-seater SUV segment in India. This is Škoda's first full-sized SUV, and comes with a 4x4 all-wheel drive system, a first of its kind. 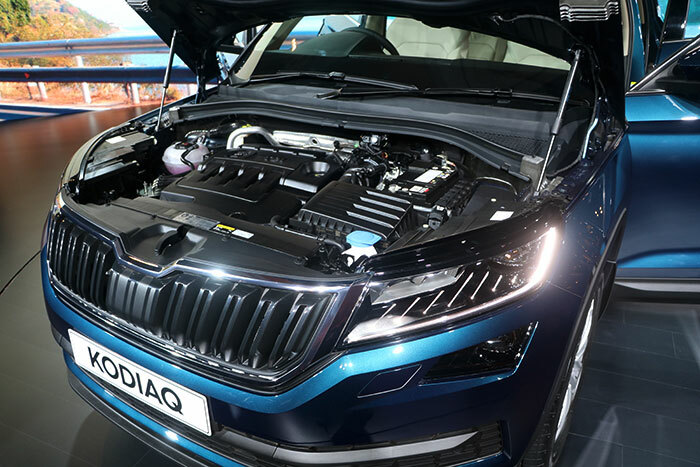 Škoda says it will deliver a fuel efficiency of 16.25 km/litre. At first glance it looks like an impressive no-nonsense SUV with a clean, diamond cut design that makes it a typical Škoda. 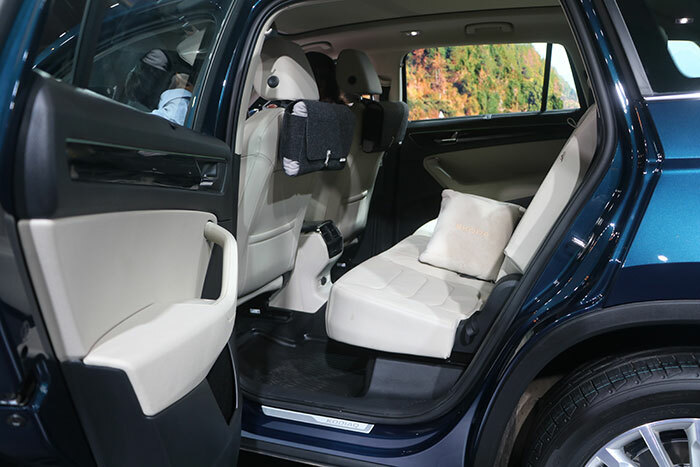 Image: The plush interiors of Kodiaq. Inside, it looks like a premium, family friendly car perfectly suited for Indian roads. 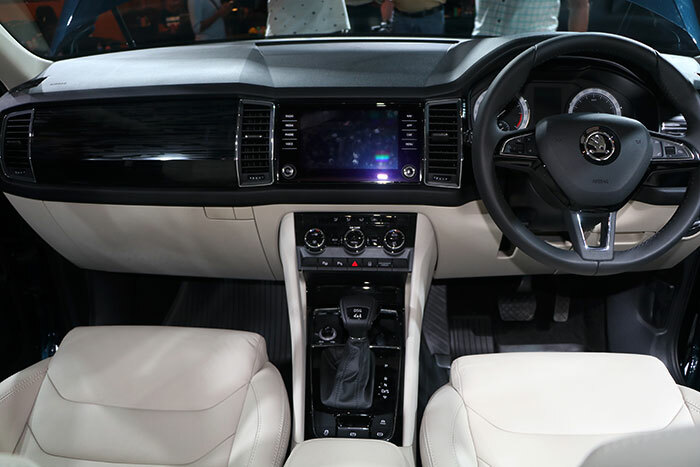 The Kodiaq presents a nice premium look and feel, and adds 10 different ambient light settings. 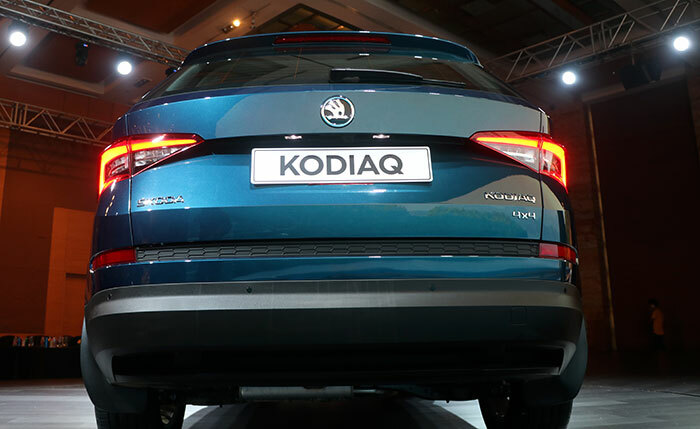 With the Kodiaq, Škoda will compete with the likes of Toyota Fortuner and Ford Endeavour. 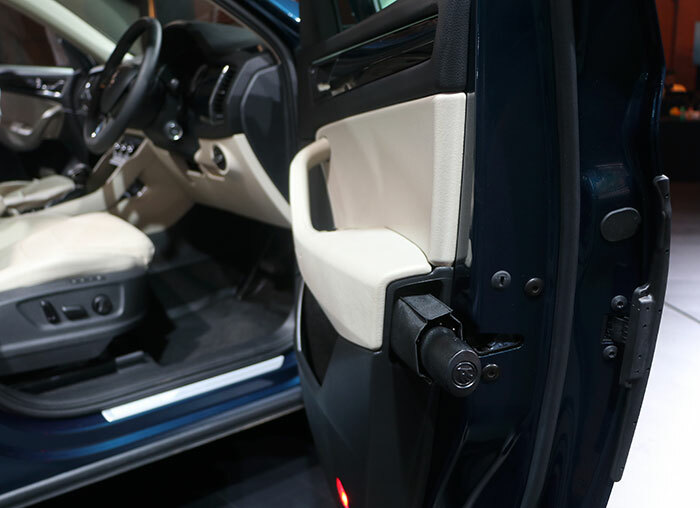 Škoda even offers 2 umbrellas with the Kodiaq, which can be stashed away into the door panels. Plus there are plenty of clever practical touches too -- like an umbrella holder hidden in the front door panel, which is not at all noticeable. It also sports a magnetic flashlight integrated into the boot. The SUV's infotainment system is compatible with both Apple and Android phones. Image: The Kodiaq comes with a 2-litre TDI engine which generates 150PS and 340Nm, and this returns a fuel efficiency of 16.25km/l. 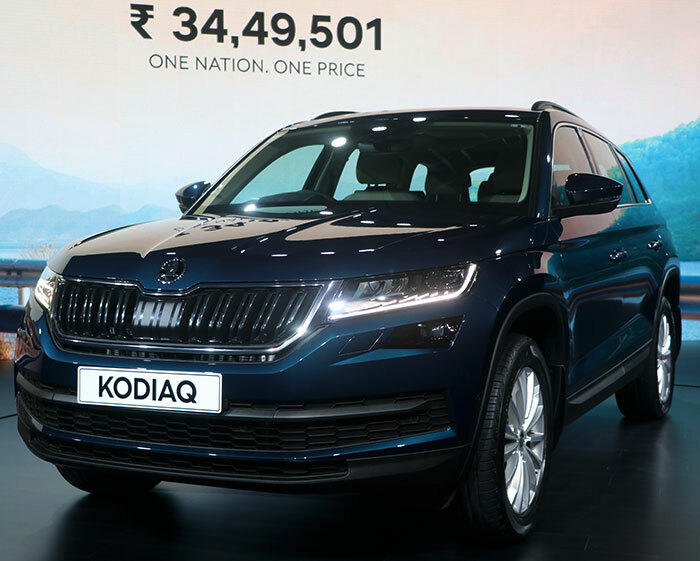 Škoda is offering the Kodiaq with a single premium 2-litre TDI diesel engine in India with a 7-speed DSG automatic gearbox -- one of the best gearboxes available here. The space offered inside is quite generous in the first two rows but the 3rd row is quite cramped. It's almost impossible for adults to sit, and maybe enough for children or small pets. The adjustable middle row allows for more space in the 3rd row. But it's still not that much. That apart, when folded down, the 3rd row makes space for a generous boot, which can be expanded more to make a 2,000-litre boot when the 2nd row is also folded. 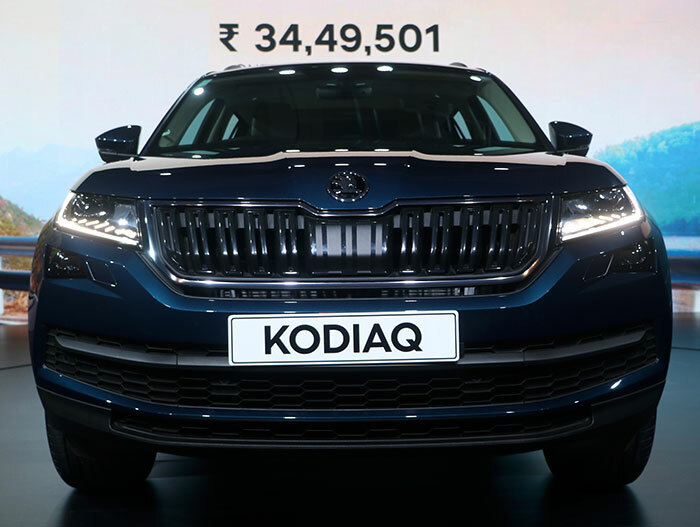 The Kodiaq comes with 9 airbags, Electronic Stability Control (ESC) , Multi Collision Braking (MKB) combined with smart assistance systems, which makes it one of the safest in India, says Škoda Auto. Image: Klaus-Dieter Schürmann and Ashutosh Dixit with Ambassador Milan Hoovarka. The Kodiaq goes on sale in 4 colours -- Lava Blue (shown here), Quartz Grey, Moon White and Magic Black. And all this for Rs 34,49,501.